In this article, Lilit Gasparyan presents the stages of denial and theories corresponding to different significant periods in the change in strategy of the Turkish authorities to deny the Armenian Genocide. She retains mainly four : The 1920s -"Such a thing has never happened" ; The 1960s - "We haven’t butchered anyone"/" The other side of the story” ; The 1970-80s – "We have been betrayed" ; The 2000s: "The conditions of war", "Just memory", "common punishment." According to the Armenian journalist, the turkish denial, even if it changes forms in different geopolitical, historical or societal contexts, is continuing for a century, passively or actively. A real policy of denial which could be summarized by this formula : change without change. Denial is the final stage1 of the genocide and as long as it goes on, the genocide keeps on living as well. Therefore, genocide originated in the Ottoman Empire and however much Turkey does not consider itself responsible for the slaughter, it continues the actions undertaken by its ancestors, following the policy of denial. One hundred years later, when we cast a retrospective look at the genocide-related policies conducted by Turkey, it becomes obvious that basically no significant change has been reported. The policy of denial has rather changed the format, language style and tone but never the content. Sometimes open and sometimes covert, denial has been always present. Alongside with the active denial of the Genocide, that is speaking on the genocidal events as ordinary ones, accusing Armenians of betrayal and presenting themselves as having the status of a victim, a passive denial also took its special place, that is keeping silence, pretending to be deaf and unaware. Active and passive denials originated in the years of genocide, and, thereafter, they obtained an ongoing character along with the establishment of the Turkish Republican 1923. Speaking about the changes of the Turkey’s denial policy, such changes might be divided into periods. Active denial took place in the 1920-30s, and then the Armenian Cause underwent the stage of silence and disregard and was put on the agenda only in the 60s, during commemoration of the 50th anniversary of the Armenian Genocide. In the 70-80s the nature of denial changed during the actions taken by ASALA (Armenian Secret Army for the Liberation of Armenia)and others and the statement "We haven’t committed any genocide" was replaced by the following ideology - "We have been slaughtered, we are the real victims and we have been betrayed". 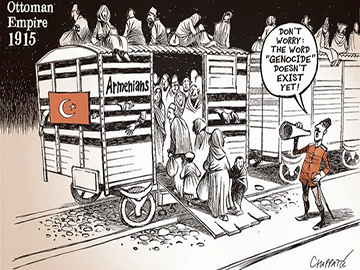 After the 80s, both the Genocide denial and, generally speaking, occurrence of the Armenian Genocide would appear on the Turkish agenda only when the Diaspora took any action on the recognition of the Armenia Genocide. The issue somehow changed its tint after the Justice and Development Party (JDP/AKP) had come to power. Perhaps, it can be said that the denial policy, which was called to life after the 2000s, was the "softest" and even successful to caress the ear of the international community. Touching upon the stages of denial policy, this article aims at opposing to the idea that there is a significant progress in the Turkish policy regarding the issue of Genocide. At that, based on the examples of the actions taken by Turkey in the stages above, the article also aims at getting a picture which will show "unchangeable changes" of the Turkish denial policy. The 1920s -"Such a thing has never happened"
Removing the history through making impossible to understand the existing records on the actions of the Ottoman authorities was the first step towards denial.The main "working" mechanism of the state ideology was the Ministry of Education, which at the same time was merged with the Turkish nationalism and, through the history textbooks, implanted deep in the consciousness of people the idea of regarding Armenians as enemy and ready to betray on every occasion. During the first years of the Republic, the book authored by Emin Ali and entitled “History Lessons for Turkish Children” was worked out especially for the fourth-grade students. The history textbook consisted of 7 different sections, starting from big civilizations and ending with the establishment of the republic. But none of the sections have had reference to the Armenian-Turkish relations. Moreover, even the word “Armenian” hasn’t been used2. Certain progress can be seen in the textbook “History Lessons for Elementary School Children; Fourth Grade” by Süleyman Edip and Ali Tevfik in 1929. Though this textbook does not cover any section related to the Armenians, in the section telling about the Constitution, the Armenians, Greek, Albans are presented as divider foreigners, who are willing to live separately from the Turks, even more, the weakness of the state makes them happy and they even have an intention to destroy the whole empire. Thus, the word “Armenian”, though in negative meaning, for the first time appeared on the pages of the official history textbook of Turkey. In 1930, in a different history textbook “History Book for my Kid; Elementary School – Fourth Grade” by Abdülbaki and Sabri Esat you can come across the following lines - “Armenia was founded in the eastern provinces… first Armenians in the west and then the French is the south were defeated”. We can say that 1930s was the period for the formation of the Turkish official thesis, when the Armenians were presented both as enemies of the Turks and the ones who assisted enemies; and thereafter presenting in every detail how the Turkish armed forces "trampled upon" Armenia. In 1933, the term “Armenian Cause” was, for the first time, used in the textbook, entitled “History III – New and Recent Periods”. The idea of subjecting Armenians to forced migration due to the war conditions is gradually casting roots in the textbooks and denial of the Genocide is acquiring a classical character. This ideology, having found its place and gradually rooted in the textbooks, is also shifting to the field of politics. In the same year, Franz Werfel finished his book "The Forty Days of Musa Dagh", which was soon banned by the Nazis in Germany, meeting Ankara’s appeals. In 1934, the American MGM company obtained and declared about the right of transforming the book into a film. In 1935, ceding to the Turkey’s appeals, the U.S. State Department mediated in the affair of MGM, and the latter, realizing the threats of Ankara, decided to cancel the project of transforming the book "The Forty Days of Musa Dagh" into a movie3. After long silence the issue of the Armenian Genocide again appeared on the Turkey’s agenda in the 1960s, when the 50th anniversary of the Armenian Genocide was commemorated in Armenia. Although the history textbooks told about the Armenians and about them being "traitors and enemies", however, the issue of genocide was missing from the public agenda and was a new topic. Commemoration of the 50th anniversary was a turning point in terms of the genocidal discussions. Turkish authorities spared no effort to have impact on teachers, journalists and public employees and to tell them about "the other [Turkish] side of the history". It was during that period when the Turkish press started "struggling" against the Armenian Cause; although the issue was put onto agenda only upon necessity and threat4. States, which gave priority to the military alliances, geopolitics, investments and trade, were also accomplices of the Turkish silence about the Armenian Genocide Cause. Thus, they were also accomplices in justifying the Armenian Genocide, making it of minor importance and simply denying it5. The 1970-80s – "We have been betrayed"
In the 1970s, speaking about the Armenians was an infamous topic because of the attacks of ASALA, Justice Commandos of the Armenian Genocide, Armenian Revolutionary Army and others. It was in this period when the statement “No Genocide has been committed, we are not responsible” was replaced by the following ideology - “We are the real victims, we were slaughtered”. As mentioned by Hasan Cemal, the Turkish society started thinking about the cause when the Armenians began to kill Turkish diplomats6. The first full-scale debate on the past actions in Turkey took place in 1973, when the Genocide survivor, a 77-year-old Gourgen Yanikian killed two Turkish diplomats in Los Angeles. The attack raised a huge tide of anger and a long-lasting silence finally broke. Turkish society and politicians began to seriously think about the actions which took place in 1915. The Turkish government also made attempts to prevent any possible discussion about the Genocide and Holocaust, including social research projects. There have also been attempts to prevent academic conferences and public debates on the issue abroad. One of the most striking examples of such an attempt was to prevent the conference to be held in Tel Aviv in 1982, if the meeting included a discussion on the Armenian Genocide. Threats directed towards the security of Jews living in Turkey was the spice added to this requirement7. Moreover, Turkey was striving to put a difference between the Holocaust and the Armenian Genocide, calling the latter "alleged" or "so-called." Thus, the term «so-called genocide" was added to the word stock of the denial of the Armenian Genocide. Since 1975, public documents have been showing how Turkey has involved PR (public relations) and lobbying firms, except for the tourism boosting sector, in such issues as the attitude of the US Congress and public towards Turkey. Advice given by these PR companies resulted in Turkey to slowly develop a new strategy of denial, choosing one of the most skillful ways of doing that – raising doubt about the cause. The Institute of Turkish Studies, founded in Washington in 1982 and directed by Ottoman scholar Heath Lowry, was perhaps the result of this strategy. The first "attack" in raising doubt by Turkey was the advertisement appeared in the New York Times and Washington Post in 1985, which called on the Congress not to pass the resolution on the Armenian Genocide. At that, 69 academics questioned whether it was appropriate to use the word "genocide" when speaking about "suffering of the Armenians". As Dr. Israel Charny says, "this advertisement heralded a new phase of diverse opinions and denial of Genocide"8. The ad became a guarantee for those denying the Armenian Genocide to present the issue on the "platform of disagreement". Thus, the idea that "the occurrence of the Armenian Genocide has not been proved yet" turned into a permanent strategy from now onwards. Of course, over the years, Turkey's attitude towards its own past and the strategy of denial underwent some changes. Turkey changed presidents, governments but the dominant strategy always remained the same and was used more openly during the office of AKP. At that time, a proposal to set up a commission of historians in the letter sent by former Prime Minister Erdoğan to the former Armenian President Robert Kocharian on 10 April 2005 was the continuation of the strategy to raise a doubt. Turkey realized that no matter how effective was the way of questioning the perpetration of the Genocide, it cannot be used endlessly. A new approach and strategy should have been drafted to be able to withstand the facts of occurrence of the Armenian Genocide. Thus, questioning the Armenian Genocide and giving it other names started to complement each other and reached their culmination on the eve of the centennial of the Armenian Genocide. Former Foreign Minister Ahmet Davutoğlu published ten-page article in 2014, by putting forward a "fair memory" concept. He also used a new term "shared pain", by putting the victims of the Genocide and the First World War under one roof. Erdoğan's letter, published on April 23, 2014, is one more manifestation of Ankara's denial, this time newly packed and well prepared. Even all people not interested in politics know it, but it should be once again mentioned here that just four months after this message, in the interview to the Turkish NTV, Erdogan mentioned that a lot of bad things were addressed to him, including "even worse, called an Armenian". The statement "even worse, called an Armenian" is used here as a "curse," for which, before uttering, he begs pardon. From "the so-called genocide" to "the events of 1915" ... As a result of passing through numerous havens, Turkey has reached this point. Many consider this as a positive development. Of course, the change is noticeable, but what change are we talking about...? Genocide in Turkey is kept on being denied officially, on the smallest occasion, let's leave alone when the third countries adopt resolutions on the recognition of the Genocide, hatred towards Armenians, and the genocide being solely "a false statement" once again glisten with their full capacity. Yet a few days ago, because Germany adopted a resolution on the Armenian Genocide, the nationalists, gathered in front of the German Embassy in Istanbul, chanted: "the best Armenian is the dead Armenian" ... This is a message about a new genocide, isn't it? One thing is obvious, all "positive" developments noticeable in Turkey always have a subtext and it implies both state and national interests. Therefore, it can be definitely stated, that Turkey is using various formats of denial. Denial is always present, only in a more acceptable language. 1. Gregory Stanton, President of Genocide Watch specifies 10 stages of genocide – Classification, Symbolization, Discrimination, Dehumanization, Organization, Polarization, Preparation, Persecution, Extermination and Denial. 4. Elmas, E., Towards 2015: Media in Turkey on the Armenian Genocide, in The Armenian Genocide Legacy, Ed. Demirdjian A., Palgrave,2015. p.183. 8. Charny, I. W., A classification of denials of the Holocaust and other genocides. Journal of Genocide Research, 5(1), (2003),pp. 11-34. What do people mean in Turkey by Armenian genocide recognition? What kind of justice for the descendants of the Armenian genocide?